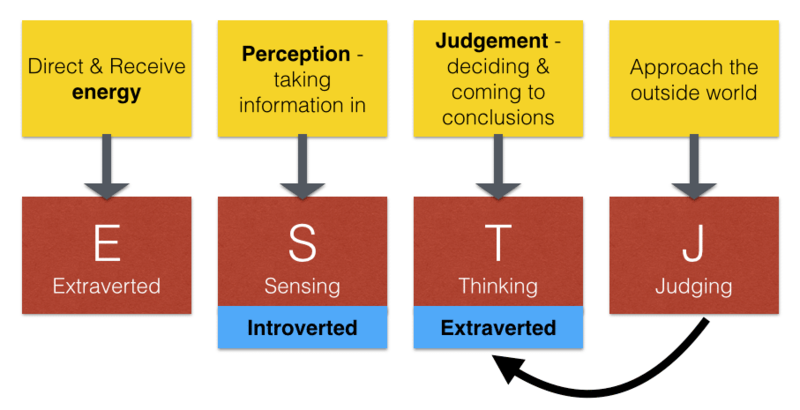 The Judger element of the ESTJ personality type means that Thinking is extraverted with this personality type and Sensing is introverted. Their preference in their processing is how they decide and come to conclusions (judgements) which in this case is through Thinking rather than Feeling. Their personality dynamic is therefore Extraverted Thinking with Introverted Sensing. Their third preference is Intuition and their inferior function is Introverted Feeling. 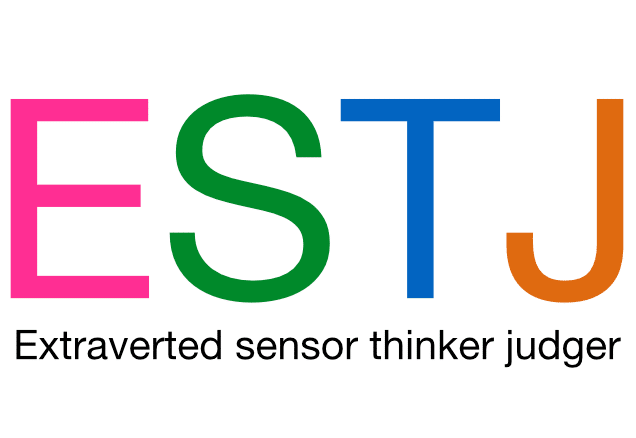 What is it like to be an ESTJ? My partner and I have been together for about 5 years. The first part of this is very difficult. J is capable of being an extreme introvert as well as an extreme extrovert – and it is very difficult to pin-point what she is going to be in any situation. I am always amazed whenever we walk down a local street about how many people know her and will stop for a chat. Yet, sometimes when we go out, she will barely say a word and keep herself very internally focussed. I think that as a general rule, she would sit slightly on the extrovert side of the continuum – she likes interaction, and certainly likes to talk. She is at her best when she is the centre of attention but is able to sit in the background and let others get on with it if necessary. She likes her own space at times but probably enjoys company more. J is more Sensor than Intuitor; she works hard at work and at home and pays very close attention to detail. The task at hand is very important and, although she does like puzzles and to fantasise about the future, she is totally down to earth. I would say that generally she is more of a thinker than a feeler – she would definitely put objective points ahead of concern about someone’s feelings most of the time. In fact, it is quite a shock when she does put other’s feelings ahead of reasonable logic. She would ‘call a spade a spade’ and if someone is likely to be upset by her reasoning, she will state ‘well, they need to know – it’ll do them good in the long term’. She is, however, very loyal to her family and friends and will get upset if someone else hurts their feelings. She is very much a judger – lists, labels, calendars etc. all play a big role in her life – she absolutely hates it when she doesn’t know the plan (which is fun for me to watch as I rarely make one – if it is left up to me then the plan is very flexible and undefined). Her day is normally well set out and everything will get done. Surprises normally don’t tend to throw her out too much as she is quick to re-establish order and get everything under control again. I have identified that my wife is an extravert; these traits becoming ever more prevalent in her character as she matures. This is evident in her ability to embrace social situations and her wide circle of acquaintances and friends; she is talkative and enjoys the company of others. She also displays these traits in her amazing and admirable ability to multi task; often easily dealing with many things at one time. My wife does however have the tendency to speak first and think later. As I assess her introvert traits it is fair to say that she is not a hugger and also has an innate need for her own company at times. Despite having to rise early for her full time employment as a bookkeeper she prefers to stay up very late on week nights watching television alone whilst the rest of the family go to bed; often leaving her tired the following day. When questioned as to why she asserts that she needs her “alone time”. As I consider this personality trait it seems to me that my wife has a very strong bias for being a sensor. She is very down to earth, in “the here and now” and never seems to fantasise. In this sense she often jokes that she grounds my tendency for the opposite! She is a person who is very much drawn to facts figures and statistics, hardly surprising given her occupation for dealing with figures. She has strong need for tangible results and has little time for speculation; she likes to chunk down and at times finds my ability to chunk up hard to understand and irrelevant. As I consider her Intuitor traits it is frustrating for me to honestly admit to struggling to connect her with any at all. My wife displays a relatively strong bias for being a thinker; she is very fair minded and extremely truthful…often disassociated and firm. She will certainly tell people when she feels that they are wrong. She much prefers logic and objectivity…however does at times find decision making difficult when the choice is not a straightforward decision. In these circumstances she will usually revert to basing her subsequent decisions upon her strong values and beliefs. Her feeling tendencies also manifest in her kinaesthetic ability; she is a talented baker, gardener, DIY’er and hairdresser. Unlikely to go with the flow, she will resist overt tenderness, however open up at times and extend sympathy and tenderness to loved ones when she can tell that they are genuinely hurting and in need.